Is White Alright the Second Time Around? 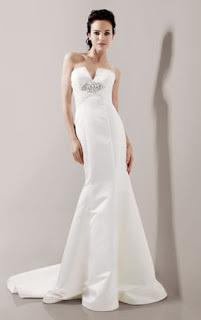 The philosophy is that a white wedding dress is only suitable for a first time bride. White conveys the fresh new look and feel of a marriage and has even been said to symbolise purity in a bride. The philosophy however is outdated. Today, white portrays a bright fresh beginning for any new marriage and has come to symbolise the joy and elegance of a wedding. Though a white dress is not demanded, it is certainly no longer discouraged. Many of the older generations, however, still believe that it is unsuitable and improper for a woman to wear white when wedding her second husband. For this reason, many brides taking their second, third, or fourth (!) walk down the aisle opt for an off-white option such as ivory or egg shell. For a second wedding, especially if both parties have been married before, brides regularly choose to have smaller or more casual celebrations and ceremonies, avoiding the stereotypical ‘big white wedding’ and going for something more funky and/or personal. The bride’s dress options can therefore include cocktail dresses and pastel ball gowns (which can be used again unlike the fluffy white wedding dress). Some ladies will always want to look and feel like a princess given the chance, opting for a big white wedding every time, and there’s nothing wrong with this. However, for the bride who’s been there, done that and is happy with the photographs to serve as the memory, a different option may be a stunning suit or that designer dress you’ve been drooling over for months but just couldn’t justify spending the dough on…until now! Your wedding is your special day, so your dress should be perfect (for you) and reflect your personality and fashion sense. If you want to wear white, wear white! If you’d prefer a colour, you can do that too. A second wedding affords you more freedom as far as dresses are concerned – allowing you to wear something more daring or laid back if that’s what you fancy but when it comes down to it, it’s your wedding and you’ll wear white if you want to!